When mixed varieties are group-planted in garden borders, parks and the like, Impatiens will hold you spellbound with its carpet of psychedelic floral colours! It is one of the most popular and best known bedding plants worldwide for its profuse flowering year round and ease of cultivation. Also, America’s favourite annual for shady sites in colder regions. 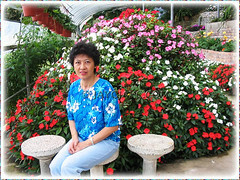 The above picture was taken at the Cactus Valley, Brinchang in Cameron Highlands many years ago where I just couldn’t resist to place myself amidst these lovelies…hmmm! And of course their dazzling and brightly coloured blossoms charmed us so that we simply had to bring home 4 pots of the New Guinea Hybrids but too bad that they perished gradually within 3 months in the lowlands. Probably due to our ignorance about its proper culture or is it because they thrive well only in the highlands? We’ve seen them flourishing pretty well in Fraser’s Hill too. Time and again, we get to see these beautiful flowering Impatiens being put on sale in nearby garden centers, nurseries and superstores, but we only admire them from a distance refusing to dig into our pockets for coins lest we face another fiasco. They’re reasonably cheap actually, about six to eight Malaysian Ringgit per 5-inch pot. Who knows, someday in the future, they may grace our garden again! Features: Impatiens walleriana belongs to the genus Impatiens that has approximately 850-1,000 species of flowering plants. A succulent, herbaceous perennial plant, Busy Lizzy as it’s popularly nicknamed, generally grows between 20-60 cm tall and spread almost as wide. It is evergreen, with a low-mounding growth habit and produces lovely foliage and gorgeous flowers that are extremely variable in colour and shape. Due to decades of hybridization, there are presently so many wonderful varieties, with the well-known New Guinea Hybrids, the showiest and most spectacular of the lot. It bears alternate leaves that are finely toothed, lanceolate to paddle-shaped and up to 12.7 cm long. Foliage colour ranges from light to dark green or bronze-green, more often has a dark red cast with midribs tinged dark red as well. Some varieties have variegated foliage and burgundy undersides. Even the stems vary from light green to red-flushed and burgundy. Amidst the dense and decorative foliage, masses of dazzling blooms appear as if to compete with one another in numbers. This prolific bloomer has an extensive range of amazing floral colours, from hues of white, pink to deepest red, yellow to orange and salmon or orange-red, and pastel colours of violet to lavender and purple. The stunning flowers, 2.54-5.1 cm across, may be solid-coloured, speckled or bicolored, and are mostly flat and can be in single or double forms. Busy Lizzies bloom continuously throughout the year in warmer climates and from early spring through to first frost in cooler clime. Flowers will develop into seed pods that explode easily with the slightest touch. Scattered seeds self-sow readily, providing an inexpensive way to cover and brighten garden spots with its spectacular and colourful display. 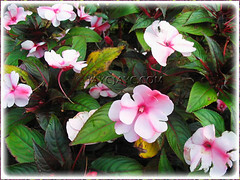 Culture (Care): An easy-to-grow plant, Impatiens walleriana or Busy Lizzy requires minimal attention yet rewards handsomely with almost iridescent blooms throughout the year under favourable conditions. Light: Bright light or filtered sunlight, preferably morning sun for best growth and flowering. Avoid strong sunshine that may cause wilting, sunstroke and even death. It does grow well at partial-to-full shade sites too but produces less flowers in low light and low temperatures. Moisture: Water regularly and moderately, keeping the soil moist but never waterlogged, allowing the surface to dry out between waterings. Do not overwater as stems may rot. Intolerant to periods of drought and intense heat, so water more during hot and dry weather and less during wet seasons. Misting is encouraged as it enjoys humid conditions but avoid wetting the blooms as they’re easily tarnished. Soil: Prefers a cool, moist, humus or organic-enriched medium and must be well-drained, but adaptable to less fertile soils. Others: Feed it every fortnightly with a balanced fertilizer during active growth. Pinch back tips in young plants to promote bushiness and profuse blooming. If it gets too tall and spindly, prune back to within a few inches of base to encourage additional branching and a lovelier compact display. Deadheading isn’t required though you can do so to keep it tidy. 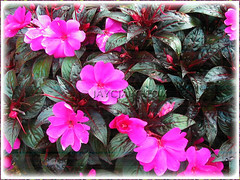 Impatiens walleriana flowers better when slightly potbound, so repot only when roots appear through the drainage holes. Watch out for signs of pests like aphids, spider mites, white flies, trips and slugs. For subtropical and temperate regions: Hardiness: USDA Zone 10a-11. A perennial in hardy regions but grown as a tender perennial or annual in shade gardens in non-tropical climates. 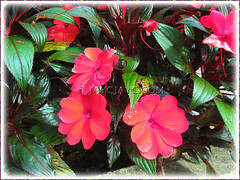 Impatiens is highly sensitive to cold and may be killed by light frosts and freezing temperatures. Reduce watering and feeding in cooler clime. Start seeds indoors 6-8 weeks before the final frost or take cuttings in the fall, root them in water and pot them once rooted. They’ll make good winter houseplants or bring them outside in the spring. Busy Lizzy will bloom year round from early spring through late fall. Propagation: By seeds that are contained in seed pods that are highly dehiscent, so best to bag them to capture ripening seeds. Germinates easily in soil and will bloom in 8-10 weeks from seed. Or simply allow the fallen seeds to self-seed which they readily and happily do. Another method of propagation is from terminal stem cuttings that will root easily in soil or water – take a non-flowering tip cutting about 7.6-10cm, cutting below a leaf joint and remove the basal leaves. Then push it into garden soil or place in a jar of water and locate in a bright position. Pot it when roots have developed. 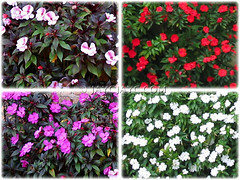 Usage: Impatiens walleriana makes an attractive ornamental in hanging baskets and containers whether indoors as a houseplant or outdoors at patios and decks. 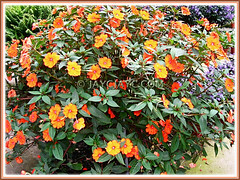 Excellent flowering plant to add brilliant colours to summer shade gardens, garden beds and borders or use as an edging, ground cover and in landscaping in frost-free climates. An extremely versatile flowering plant that shines out when mass-planted with different-coloured varieties. Grow in greenhouses for year-round flowering in non-hardy regions, as Impatiens are very reliable bloomers in heavy shade. Plant them in your garden to attract hummingbirds. 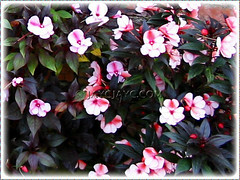 More Impatiens walleriana (Busy Lizzy/Lizzie) pictures to enjoy! When I first saw it, I thought it was balsam. I see a lot of them in Genting Highlands and at Floria 2010, but seldom seen at people’s homes. My dear friend, you look very charming among with the sea of impatients as backdrop. I agree, they do have similarities being from the same genus. Balsam thrives well in the lowlands but not Impatiens, I think…probably that’s why we hardly see the latter around our neighbourhood. Thanks for the kind compliment. 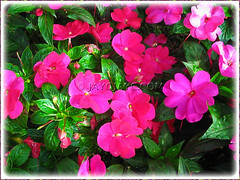 Ransacked my archives for this photo ‘cos too beautiful to be hidden away…the stunningly colourful impatiens, I meant….hehe! !